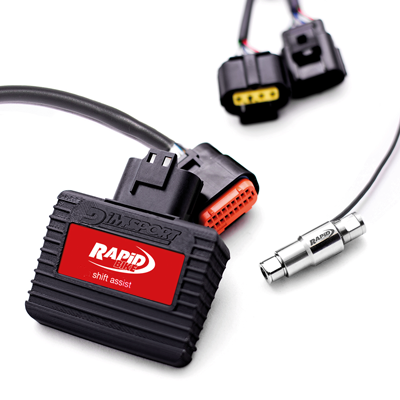 AUTO BLIPPER | Rapid Bike adaptive fuel injection tuning for all sport bikes. PLEASE NOTE: A generic shift rod will be included in this kit and may need to be resized . It is customers / installers responsibility to assure correct , safe and sound fitment and connection of the heim joints and the rod ends. New UP/DOWN SHIFT ASSIST represents a big step forward in terms of quick-shifting solution offered by RAPID BIKE thanks to a further technological development to perform up-shifting (traditional mode) as well as down-shifting operations (the so-called ‘blipper’, available only for bike models equipped with ‘ride by wire’). A new device reaching unmatched technical standards designed to deliver outstanding performance to race track enthusiasts and further improve riding experience. New shifting device exchanging information with EVO and RACING add-on modules via CAN-bus allows to perform auto-calibration of shifting kill-time in relation to the pressure applied in both directions, upper and lower gear, while matching the engine peculiar configuration. A greater bike’s handlebar control and lower mechanical stress, granted by the unique ‘self-learning’ process, improve considerably driving safety. This new accessory actually inherits all the benefits and advantages of previous ‘All around quick shifter sensor’ including full compatibility with YouTune to manage pressure level applied for activating shifting operations. Another additional feature to be managed via YouTune is the modulation of engine response sensitivity when opening throttle control.